Finally the sun warms the earth and we can see all kinds of bulbs peeking up with their noses. 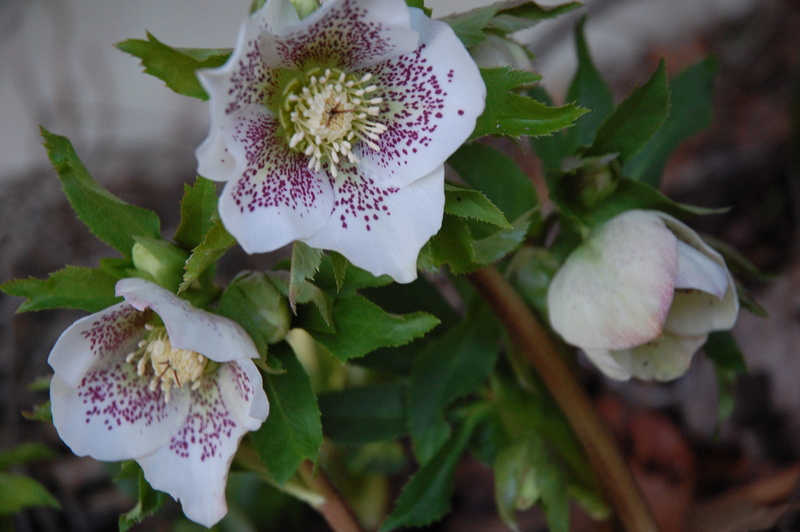 Hellebores are in full boom, even the forsythia pops by the end of March. If you planted peas or greens, you may already see new baby plants emerging! Now it’s time to get the garden cleaned up and mulched. It’s time to prune those butterfly bushes to the ground to promote bushier, healthier growth. If you haven’t already cut your sedums and fountain grasses back, do it now. Crepe myrtles can also be pruned now; many people like to cut off all growth thinner than a pencil. Learn about if and how to prune your hydrangeas here. Many people also like to lime the lawn in the spring. Now is also a good time to plant cool season vegetables if you haven’t already, like peas, lettuces, spinach, chard, or kale. You can purchase transplants from a nursery or sow seed right into the ground. Potatoes also prefer a cooler soil and can be planted now. If you like to start tomatoes from seed, you can do that now in a sunny window or under grow lights. Other warm season vegetables you can start from seed include peppers, eggplant, and basil.